Coarse cut burgers, lightly seasoned with sea salt and black pepper. 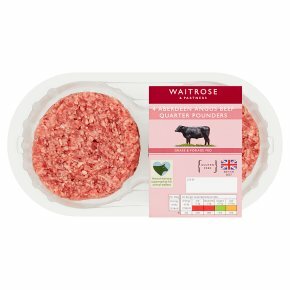 Made with beef produced from cattle bred from registered pedigree Aberdeen Angus bulls, especially for Waitrose. Great British beef produced from native Aberdeen Angus cattle. Aberdeen Angus beef characteristically has a fine marbling of cream fat running through the meat, this results in succulent, tender and richly flavoured beef. We have been working with a long established and dedicated group of Aberdeen Angus beef farmers selecting them for their high standards of animal husbandry, welfare and a commitment to sustainable farming. INGREDIENTS: Aberdeen Angus beef (95%), rehydrated potato, rice flour, sea salt, salt, black pepper, preservative sodium sulphite, maize dextrose, antioxidant sodium ascorbate. Pan Fry. Time: 10 - 14 mins. Pan Fry (icon)…Heat 1 tsp of oil in a frying pan. Place burgers into the pan, turning occasionally until thoroughly cooked, the juices run clear and there is no pink meat.